You don’t have to be at the mercy of your genes. While heredity predisposes you to certain types of disorders or diseases, you can do something about them to delay their onset or reverse their natural course altogether. With precision medicine emerging as a new approach to treat individual patients accounting for differences in genes, lifestyle and environment, and with so many non-invasive treatments available to stave off indicators of ageing, there’s no reason why you can’t look and feel young again. How? Are wrinkles bothering you? You don’t have to put up with it. A Botulinum Toxin (or more commonly known as Botox) specialist can give you a no surgery wrinkle treatment if you need a quick touch-up before a family reunion. If a more important event is coming up and you want to do something about your sagging skin, you have a choice of dermal fillers or a mini facelift via a thread lift procedure such as Silhouette Soft. Fillers are often used for volumizing, while Silhouette Soft re-shapes your face while promoting new collagen production. There’s a pervasive belief that once someone gets older, they have license to slow down and take it easy. 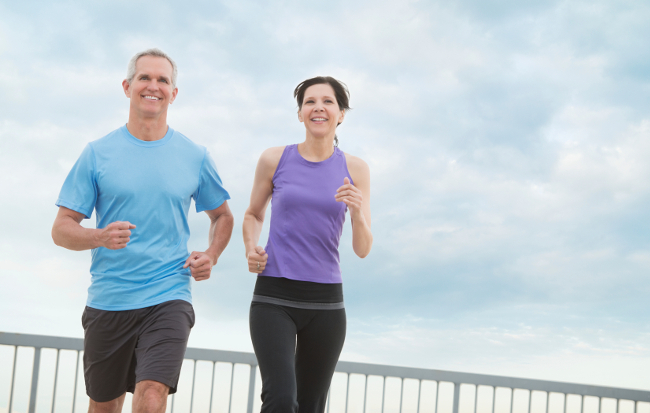 But to be truly healthy well into old age, you have to remain physically active. Refuse to be treated like a grandparent – that is, don’t let younger people pamper you. Mow your own lawn, bake your own cake. Do anything you can to spend time on your feet. This will help keep your bones strong: This is good insurance against falls that are a major cause of fractures in old age from which most seniors have a hard time recovering. Alzheimer’s and other forms of dementia are one of the leading causes of death among the elderly. You can stave off cognitive decline by engaging your mind every chance you get – be it reading the newspaper every morning with your bowl of oatmeal, playing board games with your grandchildren, or keeping up to date with technology. The goal is to remain interested in old and new ideas, and to keep that spark of curiosity alive even into your golden years. Okinawans, renowned as one of the longest-living peoples on earth, have a longevity secret: They don’t keep their plates overflowing with food. In fact, Okinawans stop eating until they are 80% full. Similarly, you can downsize portions to decrease your risk of developing obesity and diabetes, which if left unchecked, can lead to a host of illnesses that can shorten your lifespan. Then there’s the small problem with sagging jowls, flabby arms, muffin tops, love handles and jiggly thighs. These fatty areas are notoriously difficult to lose with exercise and diet alone. Thanks to advances in ultrasound technology, the same can now be used to slim your double chin. In laser clinics in Singapore and in hundreds of medical aesthetic clinic worldwide, Ultherapy is FDA-approved for treating turkey necks and crinkly décolletage as well as double chins and droopy eyebrows. Other parts of the body that do not easily yield to diet and exercise can be treated with safe infrared technology like the one used for Titan devices. Titan is a non-invasive skin tightening treatment used to slim down fatty areas and tighten sagging skin you would normally see in your arms, abdomen, flanks, hips and thighs. There’s also another benefit to calorie restriction apart from form-fitting clothes: memory loss has been observed in people 70 and older who love to eat until they are bursting. Life is full of stress, and that fact is something you should let go. But while you can’t control what happens to you, you can control how you react to stresses in your life that will inevitably arrive. A high level of stress can wreak havoc not just on your emotional and mental well-being but also on your physical health, so it’s incumbent upon you how to deal with them so they don’t overwhelm. With the body in a constant state of stress, the adrenal glands trigger the release of stored sugar in your bloodstream so your body is fuelled to fight or flee. If your body is persistently on alert, you will develop insulin resistance, a pre-diabetic condition that will eventually lead to a host of illnesses if left untreated. With stress, no age is too old to enrol in a yoga or tai chi class to bring mindfulness and calm into your daily routine. Humans are wired for relationships, which helps explain why lonely people often fall victim to depression and heart disease. When your nest has been left empty, it’s a good time to rekindle friendships or start new ones with your neighbors or groups that you come into contact on a regular basis. Arrange for weekly visits with your children and grandchildren, and regular meetups over tea or dinner with relatives and close friends. By creating a support culture, you won’t battle loneliness alone, and you can always count on someone to be there with you in case of need.